As a videographer, I love capturing all the meaningful moments that happen in-between pictures and displaying the sounds and feelings that are only possible with video...The groom's expressions as his bride walks down the aisle, the sounds of friends and family cheering and clapping when the minister says "You may now kiss the bride," the memorable words shared during the toasts, and all of the little things that so easily go unnoticed on your most important day. My goal is to capture these moments so that you can remember them 50 years from now. I edit in a cinematic documentary style. All of the packages include a complete edit of the ceremony as it happened and a cinematic edit of the highlights of your wedding day. Depending on the package, the length of your highlight video will vary. It is important to me that your highlight video reflects your personality. So it is my first priority to get to know you and what you want out of your video. I look forward to hearing from you soon! "Julie is amazing!! Best money we spent on our wedding!!" "As for most brides, my wedding day was wonderful, but a blur! What a true blessing to have every special moment from my day on video. 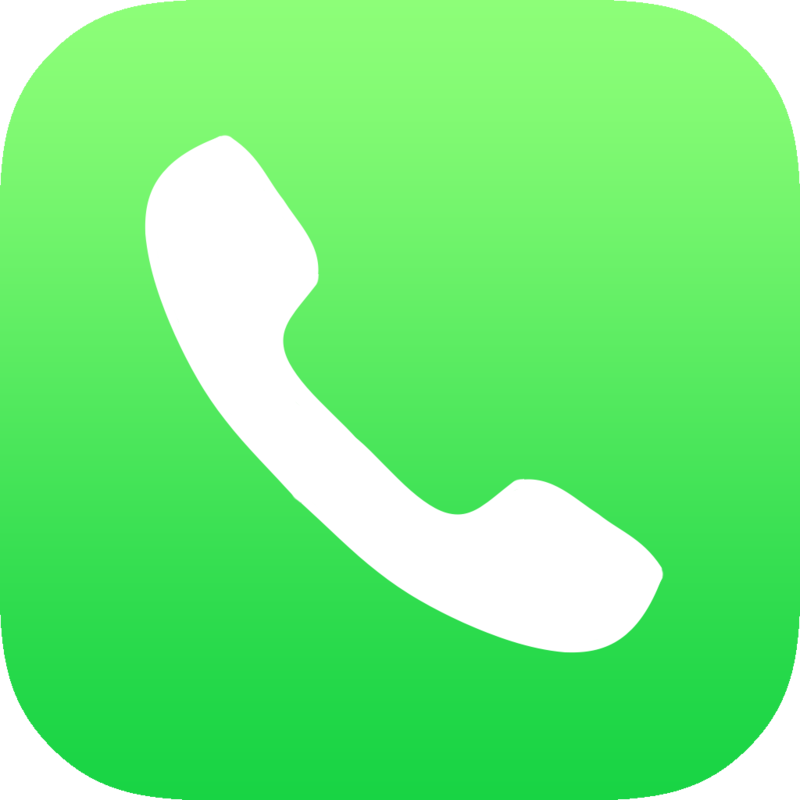 Elegant Productions' product is incredible and well worth the cost. Julie and Paul were wonderful to work with - flexible, personable, and professional. My family and I loved them! 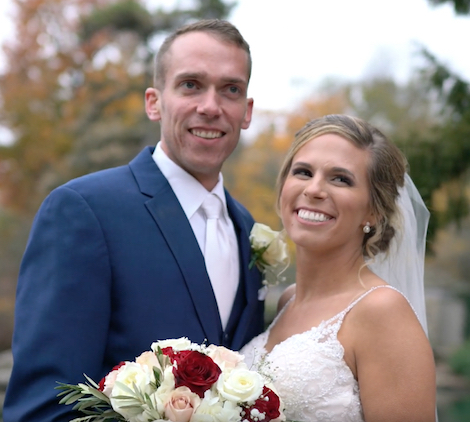 One thing I truly love is how the video brings my wedding day to life again. Pictures can only do so much. 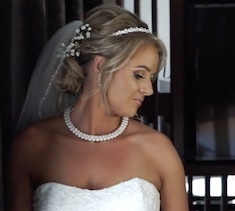 I highly recommend Elegant Productions as any bride's videographer!" "I honestly wasn't sold on having a videographer at the wedding but I gave in to my mother's requests. I look back now and cannot imagine our wedding without Elegant Productions and the amazing way they captured our special day. They shot every aspect of our wedding and were never seen or in the way. Their kindness and uplifting demeanor were such a great addition to our day. I am forever grateful for their talent!" "Julie was there from when I got out of the car on my wedding day until the time that my husband and I left. She knew just the perfect moments to catch, and she did it with sensitivity and sophistication. 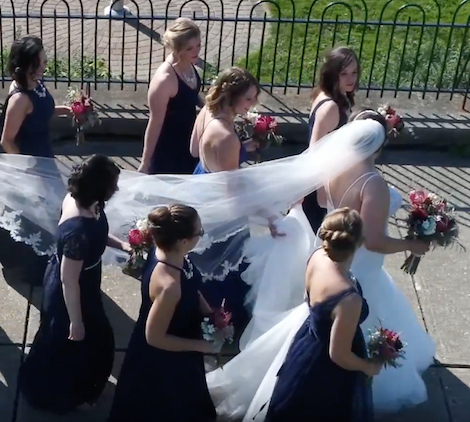 She needed no guidance in creating a video that I'll want to keep for the rest of my life, and that's exactly what every bride needs in a videographer! Julie's video is a treasure, and I have precious memories recorded that otherwise might have been forgotten in all the hurry. Thanks, Julie!" We will customize any package by request. With all of our packages, we use professional microphones to capture your ceremony audio and special moments. Be sure to tell us if you have a letter or special memory you want us to record. 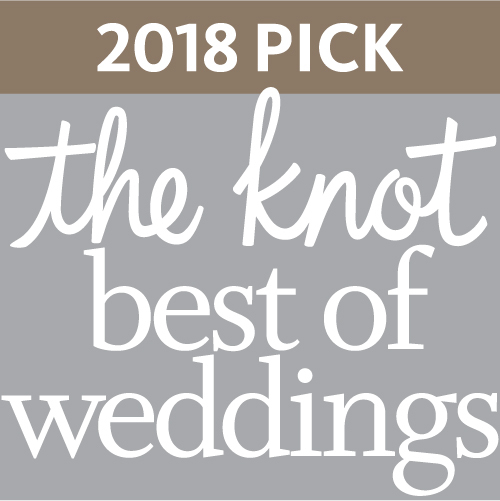 1 Location - Ceremony and reception must be at the same venue. Guest Interviews: We'll capture the wedding party, family and guests sharing their best wishes. 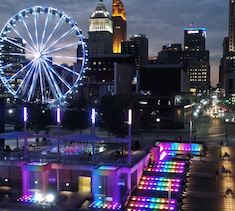 Drone Footage: We will capture your venue or other scenic views of your day from the sky. * * * Typically enough time to capture the whole day and the send off! Sneak Peek! Receive a trailer of your wedding day just two weeks later to show off your day to your friends and family. Guest Interviews: We'll capture the wedding party, family and other special guests of your choice sharing their thoughts and best wishes. DRONE Session: We'll shoot a special bride and groom session with our drone. Time Permitting: Everyone's wedding timeline is very different. 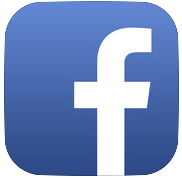 The possilbilities of what we will be able to capture is dependent on your timeline. *WHAT IS EXTENDED FOOTAGE? It's like special features for your wedding film! This includes a full-length cut of special toasts, dances, cake cutting, bouquet/garter toss, and any memorable moments of request separated into chapters with a separate menu on your Blu-ray disc. **4K Info: Watching true 4K video is actually very challenging. Not all clients will be able to take advantage of the true potential of 4K video even if you have a 4K television. Please ask us for more info especially if another videography company has promised you a disc with 4K footage (this is not possible) or a YouTube video in 4K (you still might not be watching it in 4K). There are many variables to consider if you are going to view actual 4K content. Click below to view short sample segments from some of our actual products. 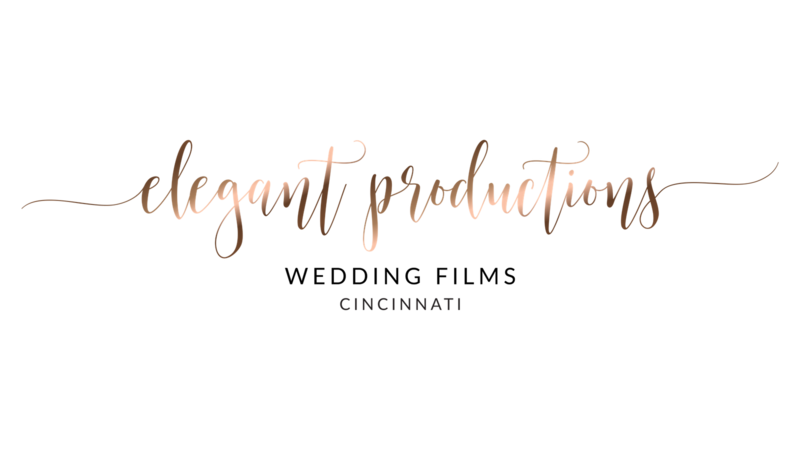 Amazing sneak peek of a gorgeous wedding in Cincinnati, OH. Full length highlight video of an amazing wedding in Northern KY. This is a sneak peek from a Platinum package wedding! Full length highlight at The Madison Event Center in Covington, KY. This is a short preview of some of our drone work. 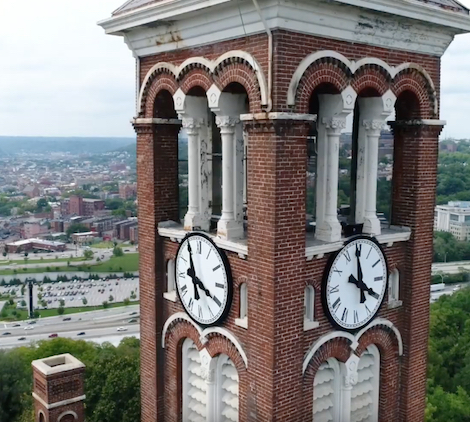 Footage from our work at The Monastery in Cincinnati, Ohio. 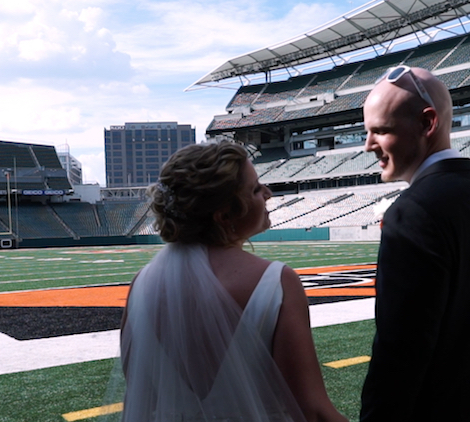 Excerpts from a gorgeous wedding with a reception at Paul Brown Stadium. Go Bengals! 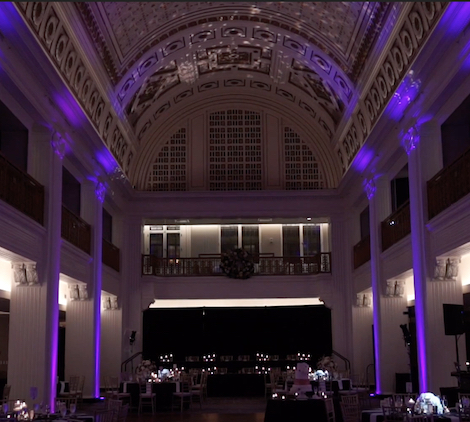 Footage from a recent wedding shot at The Renaissance Hotel in downtown Cincinnati. PLEASE NOTE: We are closed on Sundays! Sorry! Also, we are rapidly booking 2019 and Sept is completely booked! Which Package Are You Considering? I'm not sure Mini Package Silver Package Gold Package Platinum Package I need a custom package.